This year we have already experienced the heavy rains, strong winds and even a tornado. Before the next storm travels through our area it is important to know a few facts about tornado's. Tornado Tornadoes are arguably nature’s most violent storms. Generated from powerful thunderstorms, tornadoes generally appear as rotating, funnel-shaped clouds extending from the cloud base to the ground. With winds that can reach up to 300 miles per hour, tornadoes can cause massive destruction within seconds. Damage paths can be in excess of one mile wide and fifty miles long. The average forward speed of a tornado is 30 miles per hour, but may vary from stationary to 70 miles per hour. n Tornadoes can accompany tropical storms and hurricanes as they move onto land. Unexpected emergencies like severe weather call for immediate action. SERVPRO of South & East Stark County knows immediate reaction to the disaster is important to helping you get your life back to normal in the Alliance, Louisville, Canton, Minerva, Navarre and surrounding communities. If your home or business has been damaged by a tornado or strong winds our emergency crews can help board up and roof tarp your home. If your home has flooded our crews can begin the cleanup and restoration process by extracting any water, placing air movers and dehumidifiers and monitoring the drying process until the home is back to preloss condition. Call us 24 hours a day at 330-823-4088. Flooded basement from a washing machine overflow in Louisville, Ohio. When you have a water pipe break, appliance water break or washing machine water flow it is important, if possible, to immediately turn off the water source. If you are unable to shut it off yourself than contact a qualified person to stop the water source. Turn off the circuit breaker in the location of the wet area of the home or building only if the power distributor is in a dry area safe from electrical shock. Place aluminum foil or wood blocks between furniture legs and what carpeting. Remove any personal items that may get damaged by the water such as paintings, art objects, computers, documents and other sensitive valuables to a dry place. Don’t enter the affected areas if electrical outlets, switches, circuit breakers or electrical equipment are exposed to water always avoid electrical shock hazards. Don’t use your household vacuum cleaner to remove water this could cause electrical shock or damage to the vacuum cleaner. Don’t turn on ceiling fixtures if ceiling is wet or enter rooms or ceilings are sagging from retained water. Even small water damages have the potential to cause serious structural and indoor air quality issues over time. The key to avoiding costly future restoration is to handle every water problem as a real threat to your property. If you have any questions or need help to ensure your property is dried properly, contact SERVPRO of South & East Stark County at 330-823-4088. This house in Canton, Ohio lost its siding from a recent storm. After a storm you may experience storm damage, how do you know if your covered? There are many insurance claims when a storm hits Northeast Ohio during the Spring. Many homeowners have insurance to protect their dwelling and their belongings against storm and flood damage. However, some damage is not covered under an insurance policy. We have insurance to cover such damage, but sometimes an insurance company may not pay out a weather-related home claim if it feels that the homeowner has not maintained their property. What is wear and tear on a home? A severe storm can cause shingles to lift and fall off, siding may be ripped off or hail damage to both roof and siding. Although, if a roof has already been damaged by age and general wear and tear then the insurance company may not cover the claim. When it comes to flooding from severe rainfall, a claim can be disputed against gutters that have not been kept clear of leaves and other debris can contribute to water damage to the property and may not be covered. When basements are water damaged a question of how the water entered comes into question. Do you have sump pump, foundation or even drain back up coverage? If it’s not in your policy for coverage than you won’t be covered. It is important to report a storm damage claim within 48 hours to make sure secondary damage doesn’t occur. Calling a water damage restoration company such as SERVPRO can help you with determine how your water damaged happened. SERVPRO of South & East Stark County works with all major insurance companies in water claims. We have the knowledge and experience with storm, wind and water damage. To make sure your storm claim will be covered it is important to maintain your property along with checking your insurance company to see what your policy covers. If you are affected by a storm or water damage this Spring season, please call the professionals at SERVPRO of South & East Stark County at 330-823-4088. Water damage to a commercial property in Canton, Ohio. When you contact SERVPRO of South & East Stark County, you can be assured that we will arrive on site quickly and your property will be our highest priority. When your commercial property in Canton floods, it can result in a loss of business and revenue. Did you know that 50% of businesses do not reopen after a water damage? We aim to provide superior commercial water damage restoration services to make sure your business gets up and running. Flood, pipe breaks, sprinkler system water damage can be catastrophic. The devastating effects of water destruction can be brought to a minimum by calling a restoration company. Our emergency flood cleanup crews are available 24 hours a day and are IICRC certified in water cleanup and restoration. It is important to call within 24 hours of any water damage to be proactive to prevent any secondary damage such as mold growth. We use only high-quality water damage restoration equipment such as dehumidifiers, HEPA vacuums, HEPA air purification, wet vacuums, truck mounted carpet cleaning machines and fans of all types. When we begin the water damage process, we will make sure that we extract the water, control the humidity, place drying equipment to dry-out your structure to prevent mold and bacteria growth. We also have a team that will provide construction to return your business to preloss condition. 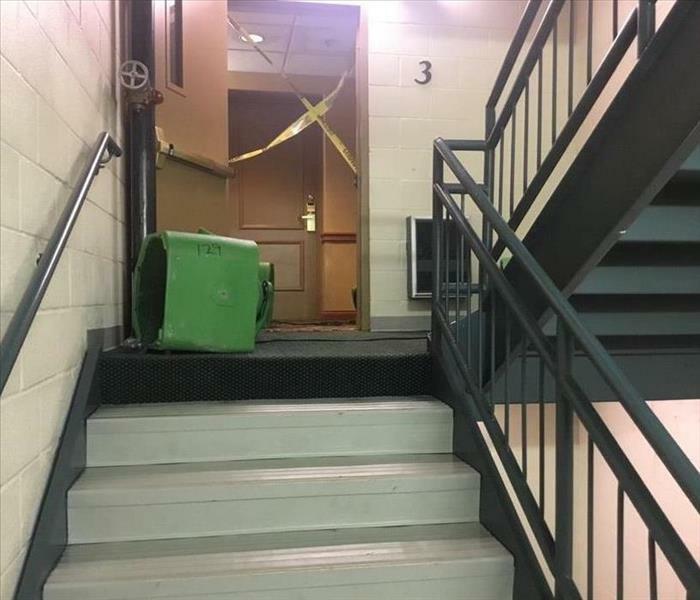 SERVPRO of South & East Stark County is a complete commercial flood damage clean up, restoration and repair company that is always ready to assist commercial property owners in the Canton area. Call us today at 330-823-4088. 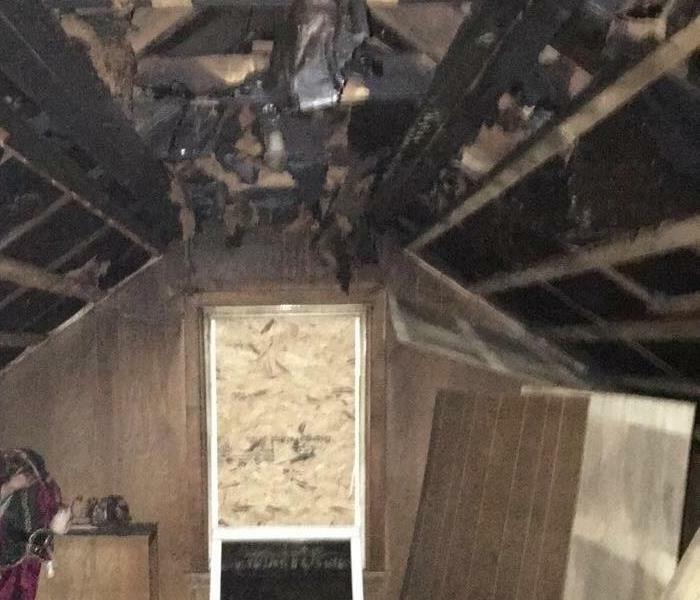 Fire, Smoke and Soot Damage to an upstairs room in a home in Canton, Ohio. After a fire to a property a restoration company comes in to clean the smoke and soot residue. After burning materials decompose, they release solid particles, gases and aerosols that become suspended in the air which is smoke. Smoke particles can be very small, and these extremely small particles are potentially very harmful to someone’s respiratory system. It is vital to remove yourself from a smoke-filled room. Therefore, it is important to call a restoration company to come in and clean a home or business that has been damaged by smoke. Restoration companies have the proper gear of respiratory masks and protective clothing to withstand long periods of time in fire damaged properties. Once smoke settles on surfaces as residues, it is often referred to as soot. Soot residues can contain different types of acids since chlorides and sulfides in smoke mix with the humidity in the air or with moisture to form acids. Acidic soot residues will cause discoloration and corrosion if they remain on materials over time. The sooner a soot damaged home can be restored the better the chances that items can be restored instead of having to be replaced. Restoring items can save homeowners money, plus being able to have cherished keepsake items returned to preloss condition. There are several types of smoke residues such as dry, wet, protein and fuel oil. There is a proper technique in cleaning each of these types of residues. Stay tuned to our next blog on cleaning different types of residues www.SERVPROsoutheaststarkcounty.com. If you have fire damage to your home or business, please call the professionals at SERVPRO of Stark County at 330-823-4088. Our professional crews are available 24 hours a day – 7 days a week, even on holidays! Your property and belongings will be restored with care! A Canton Ohio basement flooded after a rain storm. When the seasons change and winter slowly melts away into spring water damage can become a problem. Certain precautions can be taken in order to prevent the common causes of water damage while saving you money on clean ups. There are many different precautions a homeowner can do, but here are the top 10 prevention tips on how to fight water damage this spring. 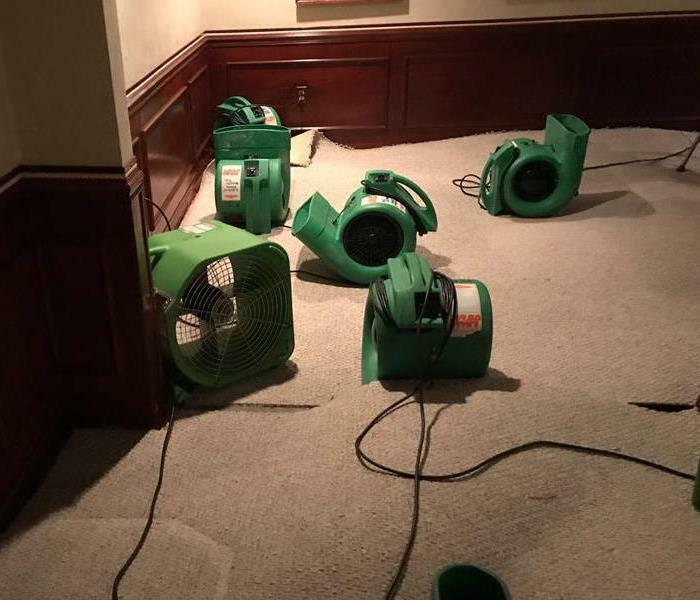 SERVPRO drying equipment in a home in Stark County, Ohio. SERVPRO of South & East Stark County is a full-service cleaning and restoration company. We provide restoration services for water damaged residential home and commercial buildings in the Canton, Louisville, Minerva, Alliance and surrounding communities. When you experience a water disaster it is a traumatic event and your daily activity is severely disrupted. When you have excessive water and moisture to your indoor environment it could pose a health risk for the occupants and be very destructive to the building structure and its contents. It is important to effectively restore a water damaged building properly for homeowners and business owners. Properly drying and restoring a water damaged structure requires training, expertise and specialized equipment. If not resolved properly, water intrusions cause severe damages to structures and contents and if not clean up quickly then the damage can become severe. Water may enter a structure from broken water pipe, leaking water heaters, washing machine overflow, roof leaks, fire fighting efforts after a fire, sump pump failure, flooding, sewer backups, and many other sources. At SERVPRO we try to restore all items before replacing them. If the water is clean such as a pipe-break than we can clean up and dry out the structure and belongings. If the damage was caused from sewage than materials can’t be saved and items must be disposed. 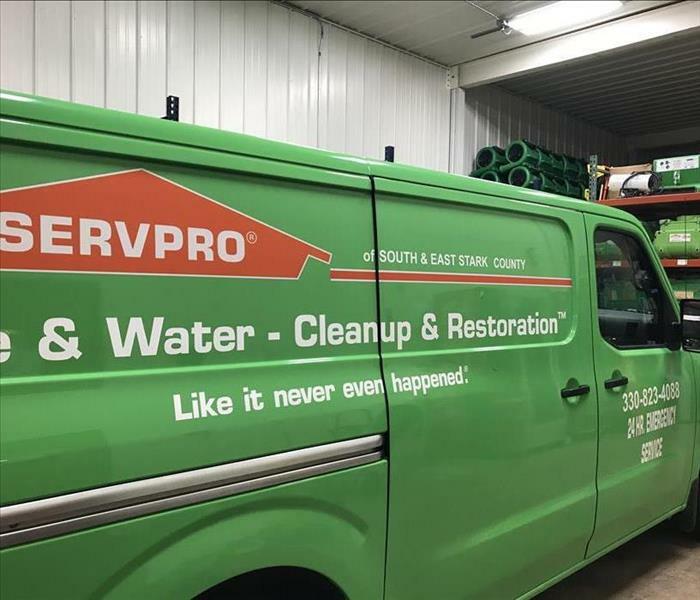 If you need clean up and restoration after a water damage than call the professionals at SERVPRO of South & East Stark County at 330-823-4088. We are available 24 hours a day! Fire Damage Contents are removed from a home in Canton Ohio. Mitigation Services: The goal of mitigation is to secure the structure and prevent further damage. Mitigation could include boarding up the area that was damaged to secure the structure and establishing a temporary power hookup. If the structure is wet from the water used by firefighters than emergency dry out procedures will begin to prevent secondary water damage. Structural Cleaning Services: Cleaning of a fire- damaged structure focuses on removing smoke residues from the structural components and deodorizing odors given off by residues. The restoration company and the insurance adjuster consult and advise the property owner on the restoration process that will be cleaned and what will not be cleaned. This step determines which items can be restored and which items need replacement. Contents Cleaning Services: All personal belongings will be cleaned of all smoke residues. 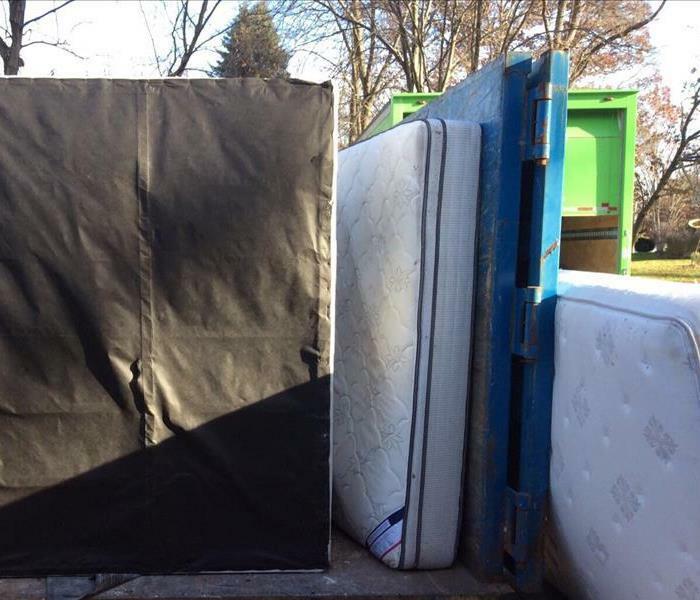 If the contents can not be cleaned on the jobsite than items will be packed out and moved to another location to be cleaned and repacked and stored. Pack-outs usually happen when the home or business is not secure or is too fire damaged to clean on site. Specialty Restoration Services: If items such as electronics, dry-cleaning or refinishing special furniture or art work will be sent to specialized subcontractors to be restored. Reconstruction Services: In some fire situations, structural damage has occurred and restoring cannot be done to preloss condition, so rebuilding is necessary. SERVPRO of South & East Stark County has the capabilities to board up your home right after the fire, mitigate, clean up and restore and very damage items and even rebuild your home or business. Call us today 330-823-4088. A sump pump back up after a power loss in this Minerva, Ohio home. Water damage can be detrimental to your home if not stopped before. Water damage is commonly discussed in a five stage process. Knowing the five steps is important so you can assess your damage and call professionals before your house reaches extensive damage. Stage one - The free flow of water. Due to gravity water will want to travel until it is level. Water will travel through your walls and flooring and can lead to damage. It is important to report water damage at this step to lower costs to repair your house. Stage two - Any materials in direct contact with water absorb moisture.The damage caused to these materials will continue as long as contact is maintained. The damage can be reflected as swelling, cracking or warping of furniture and other hardwood materials. To save these materials action needs to be taken before the water ruins them. Stage three - High humidity damage inside the house. If moisture is not dealt with at an early stage it will continue to evaporate into the air resulting in materials such as books, photos, and other art to be damaged. High humidity can be apparent through ceiling sagging and condensation on walls. The humidity can be revered by using high power dehumidifiers. Stage four - If high humidity isn’t taken care of then the damaged materials will support the growth of microbes and fungi along with other microscopic organism. Air quality will decrease as microbial growth increases. In order to reduce the growth of microbes professionals control relative humidity, air circulation and temperature. Stage five - If still left unattended microbes and microorganisms will spread to other areas that were previously unaffected. Mold, mildew, and associated odors among pathogens may spread throughout buildings. At this stage professionals and air quality contractor and professionals who will make comprehensive plans to address the spreading problem. 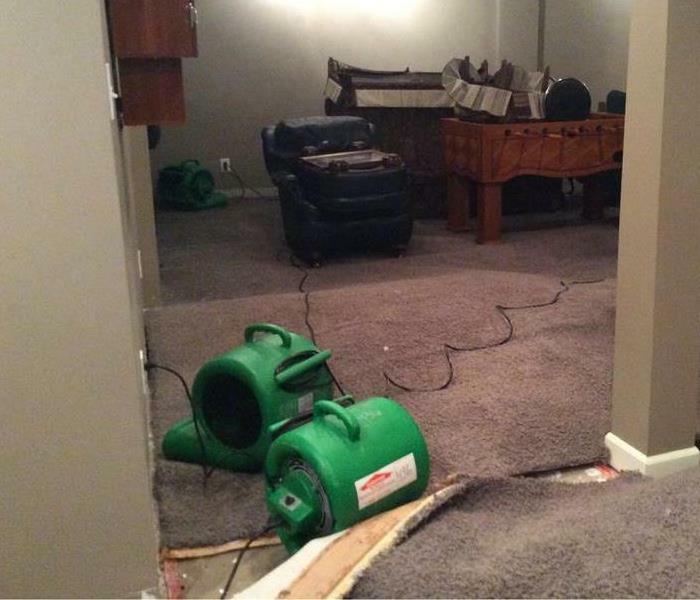 If you do find yourself facing water damage at any stage call SERVPRO of South & East Stark County at 330-823-4088 and we will restore your property to preloss condition. Our trucks and warehouse stocked with equipment ready for the spring rain storms in Canton, Ohio. During the spring in Northeast, Ohio we experience heavy rains and violent winds and during these storms many homes have suffered from flood and/or water damage. Many of the water in the local rivers, streams and ponds tend to rise and breach their banks and the extensive rain saturates the grounds. As a result, the excessive water will have home or business owners with severe water damage. Our crews at SERVPRO of South & East Stark County are experienced with water damage and can help dry out, clean and restore your water damaged home or business. SERVPRO has the equipment and the experience to restore any size water damage. Whether you have a sump-pump back up, sewage back up or the excessive rain water flowing through your home, SERVPRO of South & East Stark County can help remove the water, dry out the damaged areas, and restore the damage as if nothing ever happened. SERVPRO of South & East Stark County can reduce the damage that is caused by severe storms in the Canton, Ohio area. Our crews will be able to assist in reducing the damage caused by the any flooding or back-ups. It is important to get your structure dried out quickly before secondary damage begin like mold growth. Mold can grow within 24 hours after gray water or black water from flooding has entered your home or business. By reacting quickly and calling SERVPRO of South & East Stark County immediately, the mold can be prevented or at the very least minimized before it has caused too much damage. If you should experience Water damage, flood damage or storm damage to your Canton, Ohio home or business, call the water damage cleanup and restoration professionals at SERVPRO of South & East Stark County at 330-823-4088.